The sarcophagus, which depicts the 12 labors of Hercules, was put on display in an official ceremony on Sept. 24 with the attendance of Culture and Tourism Minister Numan Kurtulmuş. The sarcophagus, found during illegal excavations in the ancient city of Perge in Antalya, was delivered to Culture and Tourism Ministry officials in Geneva on Sept. 13 and returned back home to Turkey in the following day. 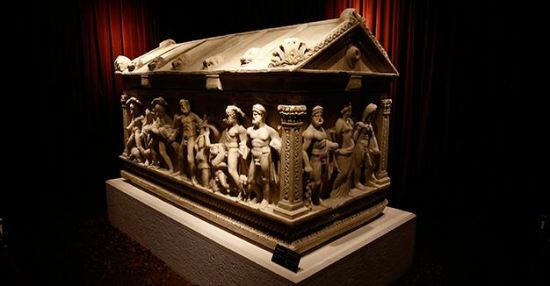 In March 2011, the Swiss federal culture office said the sarcophagus came from Turkey, from the ancient city of Dokimion - present day Antalya province, when the area was under Roman control. In October 2013, the magistrate in charge of the case traveled to Turkey to hear witnesses and examine evidence. And in 2015, a Swiss public prosecutor ordered the return of the sarcophagus to Turkey. The two countries agreed on the display of the sarcophagus for three months at Geneva University. Turkey has sought to get the sarcophagus back since 2011. Kurtulmuş thanked everyone who contributed to returning the Roman sarcophagus of Hercules back home, noting that there are many other historic pieces which were smuggled abroad from Turkey. He noted that it was not easy to bring such pieces back to their homes, adding that the ministry was in contact with foreign authorities to return 57 pieces back to Turkey. “Turkey may not have any natural resources, like oil or natural gas, but has much historic richness. We will keep preserving and unearthing them,” Kurtulmuş added. The sarcophagus has been put on display at the Antalya Museum along with the statue of Weary Herakles, which was repatriated to Turkey by the U.S. after 30 years abroad.